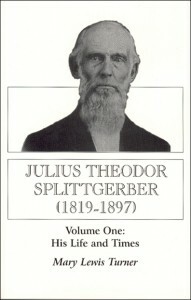 This biography of Julius Splittgerber, written by his great-granddaughter, provides fresh insight into existing accounts of both the mid-nineteenth century German colonization endeavor in Texas and the subsequent role of these German settlers during the Civil War and Reconstruction years. Splittgerber, a Prussian army officer, came to Texas in 1845 as a messenger for Prince Carl Solms Braunfels, and served the Verein in the capacity of courier until its demise in 1853. He became a U.S. citizen in 1851 and resided in Fredericksburg from 1845 to 1876, spending the last twenty years of his life in Menard County. Mary Lewis Turner has also compiled a companion genealogy of the Splittgerber family which she published in 1998. Her books are well researched, and though scholarly in preparation are enjoyable reading for everyone interested in the early days of Texas and especially the Hill Country.